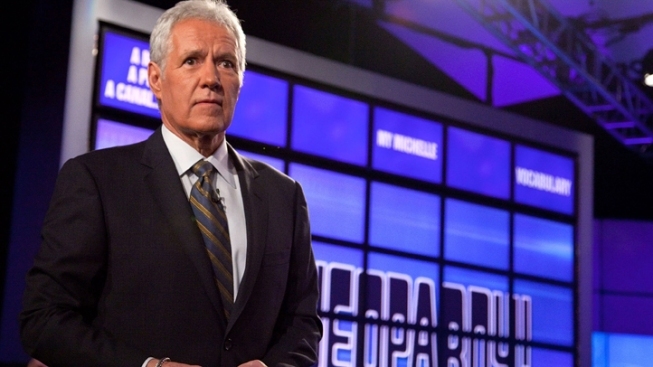 By the third clue, Alex Trebek suggested the show "just go to commercial break"
In this file photo, "Jeopardy!" host Alex Trebek. "Jeopardy!" contestants are known for their intelligence, but even the best of them have at least one weak category. On Thursday night’s episode of the popular trivia game show, all three contestants appeared to avoid one category: Talkin’ Football. With the Super Bowl around the corner, it was only fitting that "Jeopardy!" would test the contestants' gridiron knowledge. When the trio was forced to tackle the only row of clues left, no one dared to buzz in on any of the five questions — not even to guess. "I can tell you guys are big football fans,” host Alex Trebek joked. By the third clue, Trebek suggested the show "just go to commercial break." As the last clue was revealed, Trebek capped the sports trivia failure with yet another dig: "Let's look at the $1,000 clue, just for the fun of it," adding that if the contestants "ring in and get this one, I will die." After the show, "Jeopardy!" tweeted the football fail with one last taunt: “Fun fact: Our contestants answered as many clues in this category as the @Browns had wins this season,” the caption read.